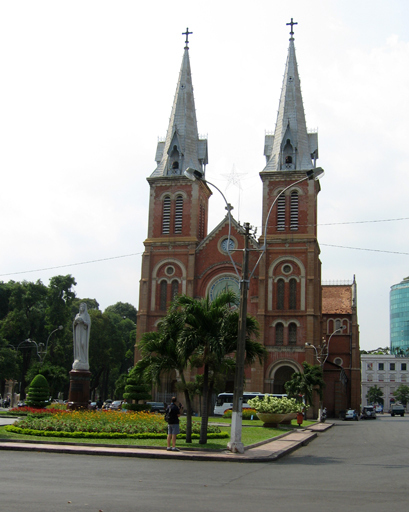 Ho Chi Mien City (HCMC) still possesses much of the charm that old Saigon was famous for, lady's in conical sun hats, beautiful parks and wide boulevards. 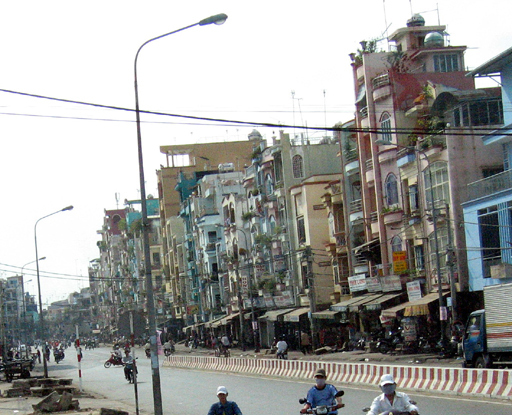 The name Saigon is still used, but now refers only to district 1, which is a small part of the greater HCMC. 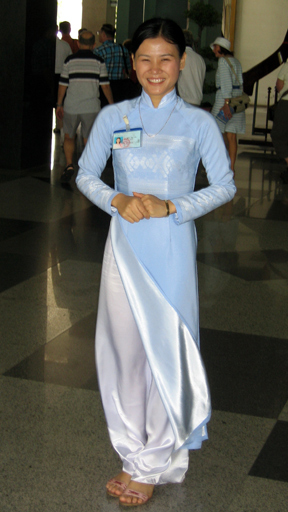 The ao dai (pronounced ow-yai in the south), one of the most graceful and most Vietnamese of women's attire, is worn here by a guide at the Reunification Palace. Banned by the communists until 1989 it is slowly making a comeback, but sadly we saw more women in blue jeans than ao dais. Colonial era Sino-French architecture is still apparent in many areas adding charm to the city. During three days on our own and two days touring the city with the Pandaw tour we saw many of the most popular tourist sights. 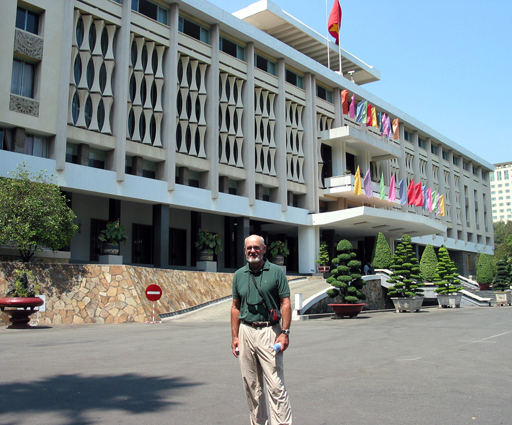 Here is Walt in front of the Reunification Palace. 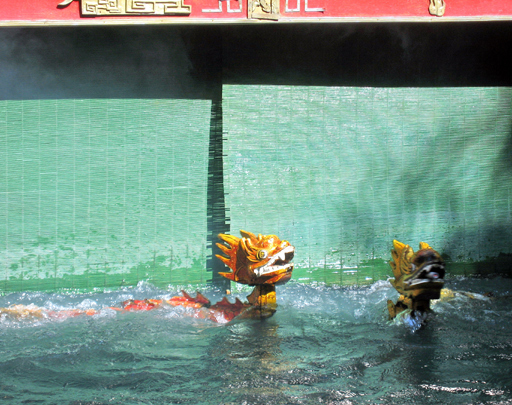 Water puppetry is a uniquely Vietnamese art form and is used to tell stories of the local culture. The History Museum stages performances. The Notre Dame Cathedral, in this once very Catholic city, is a remnant of the past but still manages to keep going in the modern communist city. The main post office across the street from the cathedral was built in the late 1800's and is another of the architectural gems of the city. 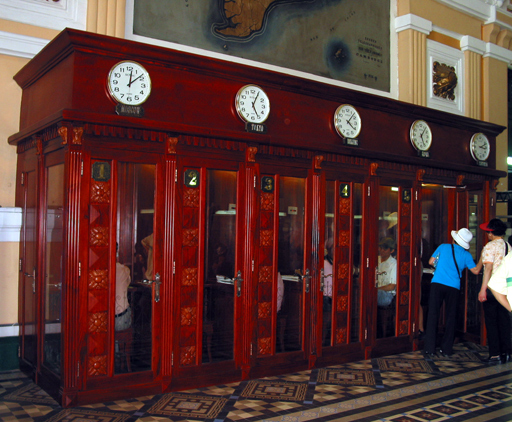 These beautiful old phone booths are still attractive after over 110 years of service. 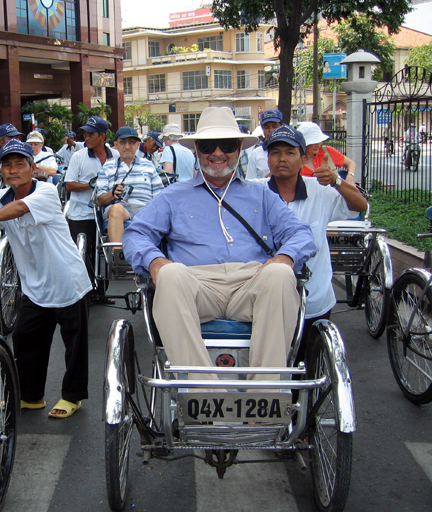 A cyclo ride through the teeming streets is a "must do" for tourist. Note that the passenger is at the front end of this contraption. It may have been all well and good during the days without motor-cyclos, cars, buses and trucks. Nowadays it can be exciting. 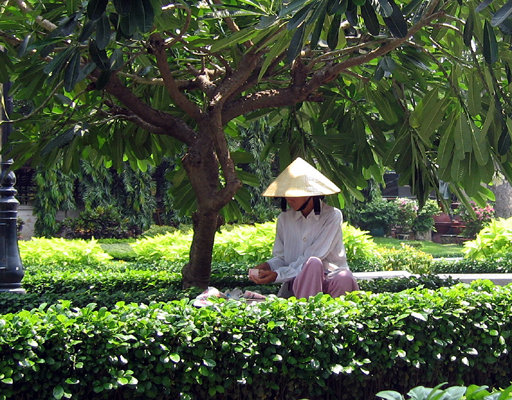 Cu Chi, a village of about 80,000 people during the 1960's and less than 20 miles from Saigon, is famous in Vietnam's war lore. In and around Cu Chi the Viet Cong built some 150 miles of tunnels stretching from Saigon to the Cambodian border. These tunnels played no small part in the North Vietnamese victory. Despite the obvious propaganda, a visit to the tunnel museum is interesting. They are truly an amazing feat of human ingenuity. 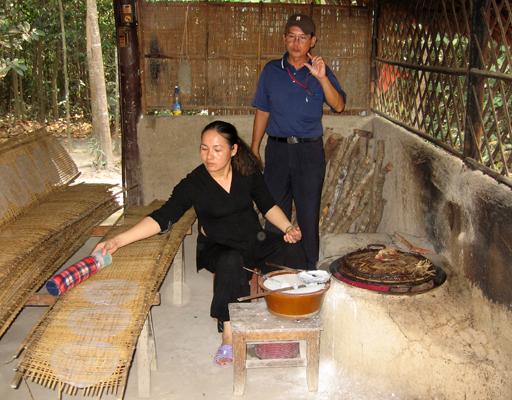 In this photo a "VC camp cook" prepares rice paper used to wrap food. 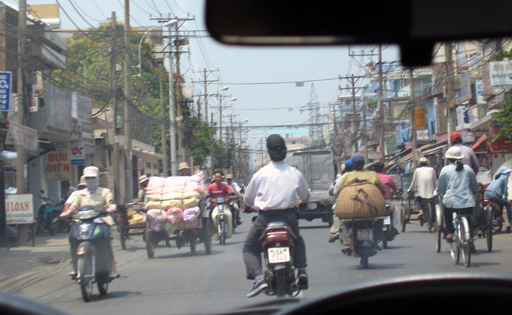 Of all the interesting sights the city has to offer, it is the invigorated hustle bustle of the streets that most defines HCMC. This scene taken thorough the taxi window on one of our early forays, is typical of the street scenes in most parts of the city. Every manner of traffic, doing every manner of tasks, and in a hurry to get it done. The Cholon district is the old Chinatown and even though many of the Chinese fled during the communist take over, many still remain and many have returned. It is still a teeming district. 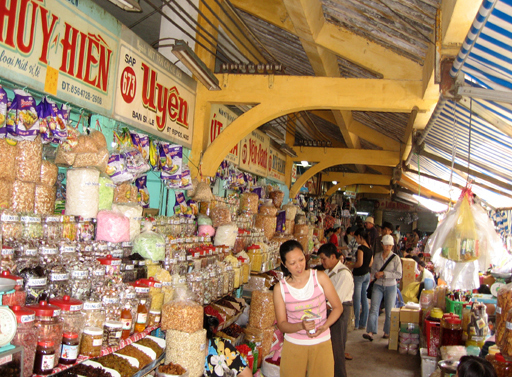 The main market in Cholon is expansive. If you can't find it there it probably doesn't exist. When the government started allowing private enterprise the entrepreneurial spirit of the people found expression in every form. People seemed to find ways to get by. 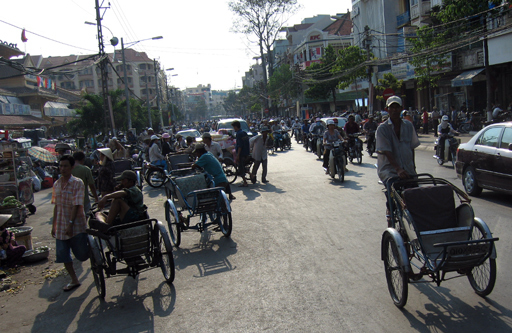 Earning a living in HCMC often requires hard physical labor. 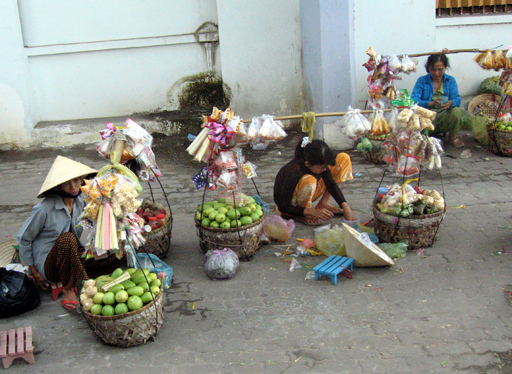 These ladies carried these heavy baskets through out the city. 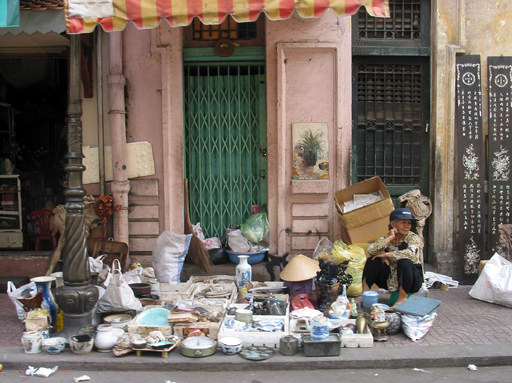 Many side streets had ad hoc markets. This street specialized in antiques, likely as not, these are vestiges of a past life that disappeared in 1975. 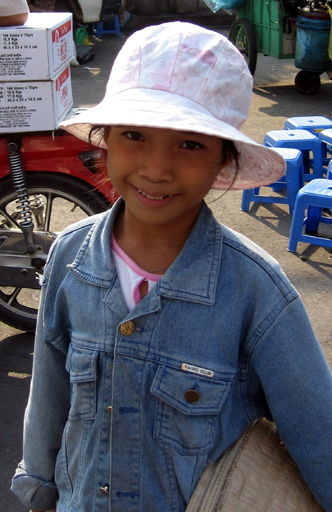 This pretty little entrepreneur was quite a sales person and was able to talk Jane out of a couple of bucks for a conical hat. 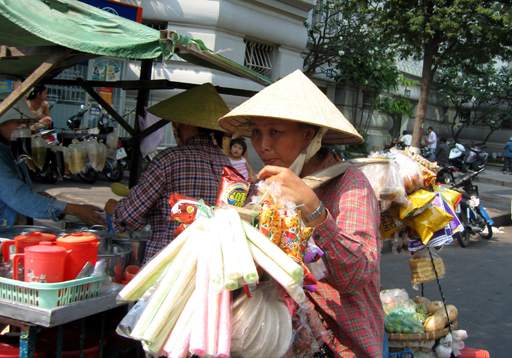 Since the 1990's Vietnam has liberalized their economy and allowing private ownership of business. 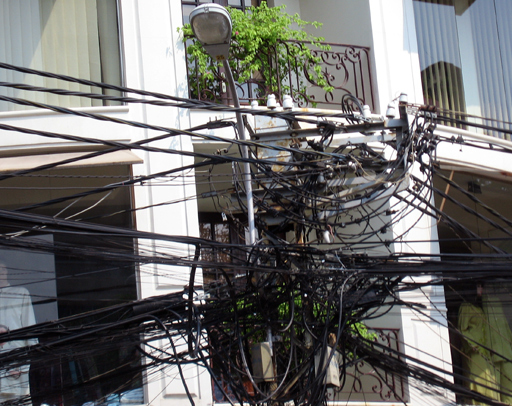 The result has been rapid economic growth with which the infrastructure is struggling to cope. 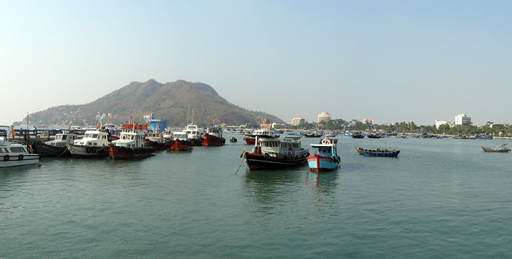 Vung Tau lies a little over 75 miles SE from HCMC on the South China Sea. 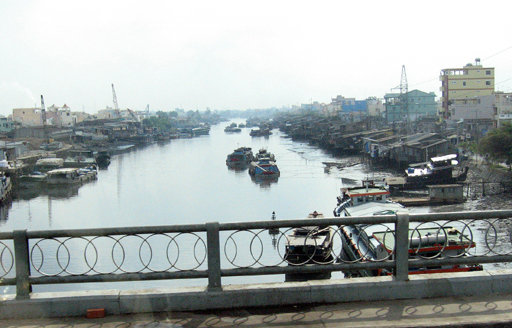 We went there by hydrofoil, not so much because we wanted to see Vung Tau, but because we would traverse Walt's stomping grounds when he was here in the war. The most interesting part of the trip however, was the return when the hydrofoil traveling at about 50 MPH collided with a sand barge. The port bow foils were ripped from the hull leaving a gapping hole through which the vessel began taking on water, going down by the bow and listing to port. The crew acted quickly and efficiently and a submersible pump was able to keep up with the incoming water. We were transferred mid-stream to another vessel and continued our journey unharmed and dry. In all our sailing it was the first time we donned lifejackets in anticipation of abandoning ship. 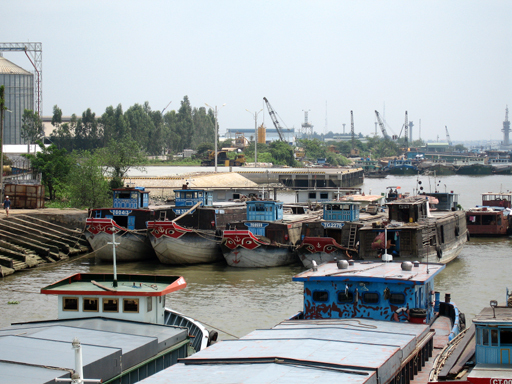 My Tho being the closest city in the delta to HCMC is the gateway to the delta and a bustling river port. It is here we boarded the RV Mekong Pandaw. 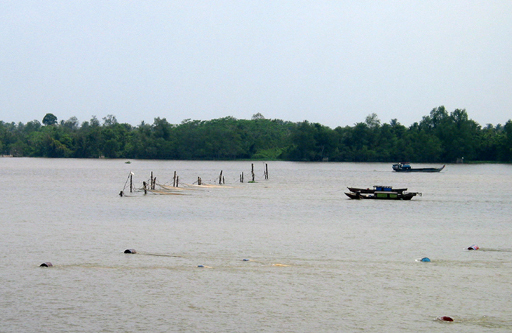 The Mekong itself, divided into two rivers in Cambodia and has divided several more times before arriving at My Tho. It has some 30 miles to go before reaching the South China Sea which it enters at nine separate locations. 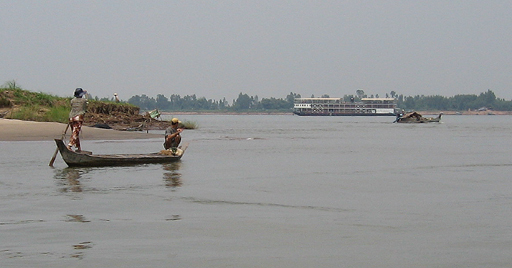 The Mekong reaches its highest level at the end of the rainy season in September. At that time much of the Delta is flooded. It is at its lowest at the end of the Himalayan snow melt in May. We are already in the low water season and the river is tidal. 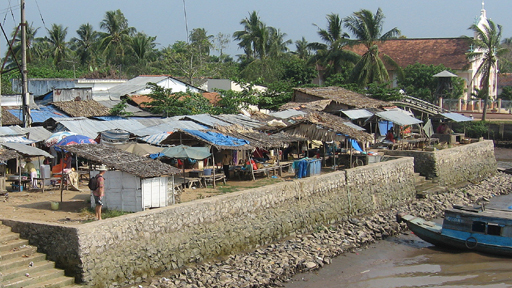 At low tide many of the canals are impassible. 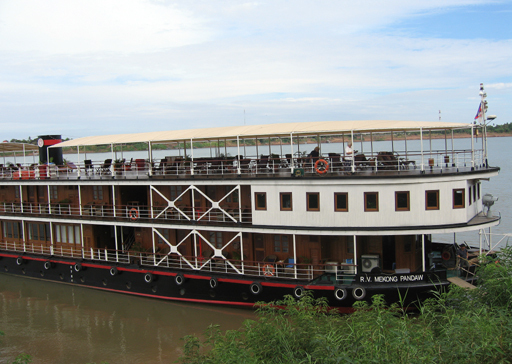 The RV Mekong Pandaw would be our hotel for the next 8 days as we motored up the Mekong. 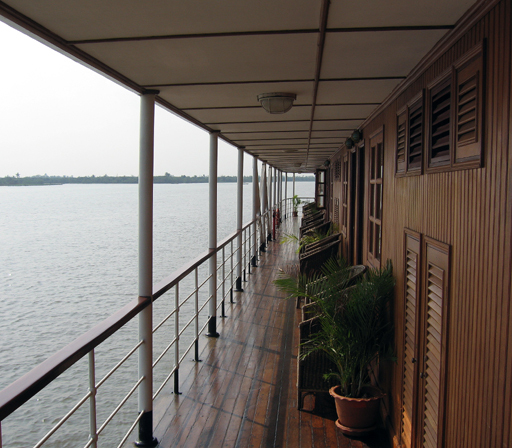 The Pandaw river cruise ships were purpose built, but based on the old Irrawaddy Flotilla Company vessels that plied that great river from Rangoon to Mandalay before being destroyed during WWII. This photo was taken just outside our cabin door on the second deck. 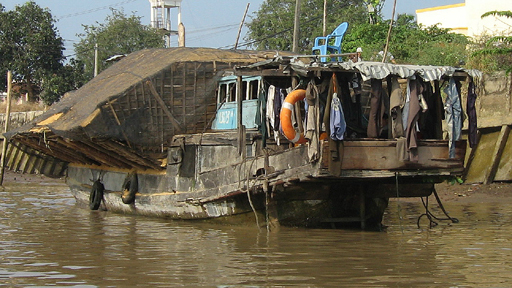 Boats like this are the main means of moving cargo in the delta. The eyes ward off evil spirits that lurk in the river. 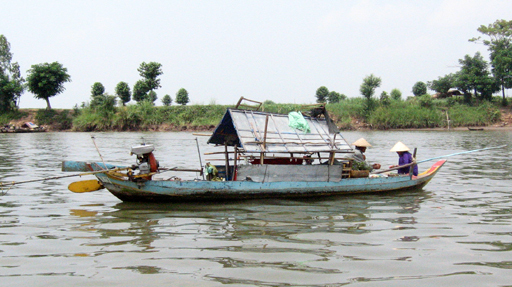 At the other end of the scale is the sampan. It is ubiquitous in the Delta and comes in many shapes and sizes and is used for many tasks. 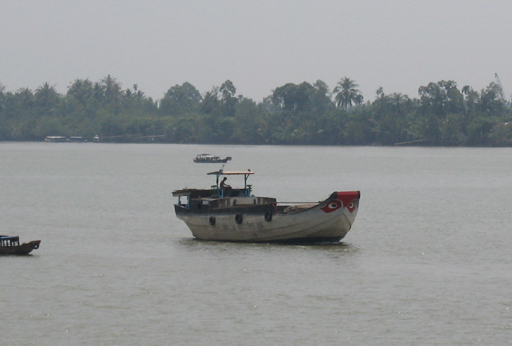 The Delta produces enough rice to feed all of Vietnam and then some, but fishing is also an important industry. Nets like these are common. This rice barge, loaded to the gunwales and beyond, is waiting for the tide so he has enough water to move to the mill. 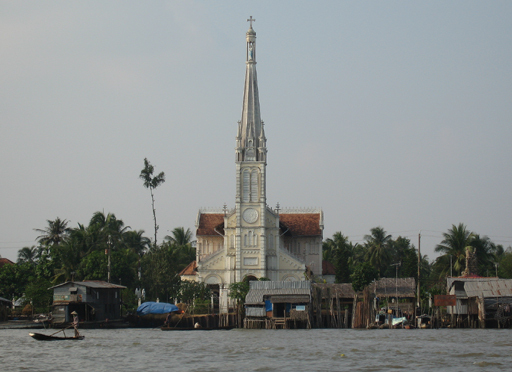 Most of the inhabitants of the Delta are ethnic Vietnamese, but there are sizable populations of Chinese and Khmer and most of the major religions are represented. 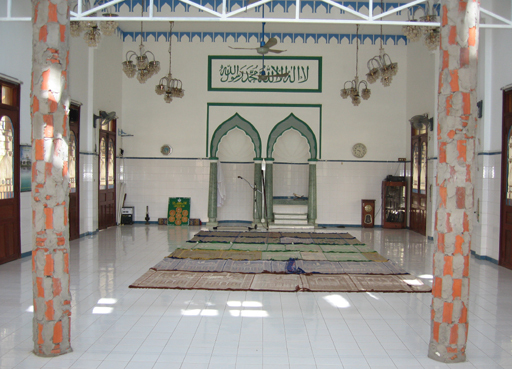 Here is the interior of a mosque in a mainly Muslim village. 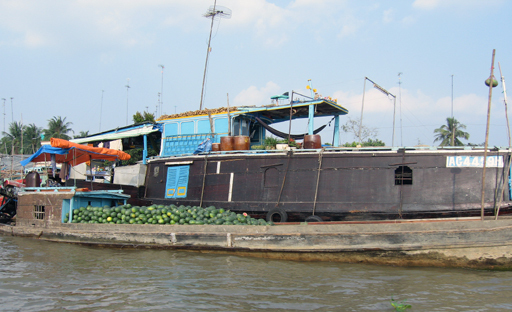 There is a large floating market at Cai Be where barges full of produce anchor. They advertise their products by hoisting a sample up the mast. 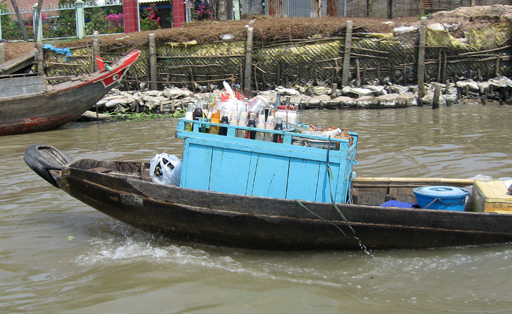 This mobile bar provides cold liquid refreshment at the floating market. 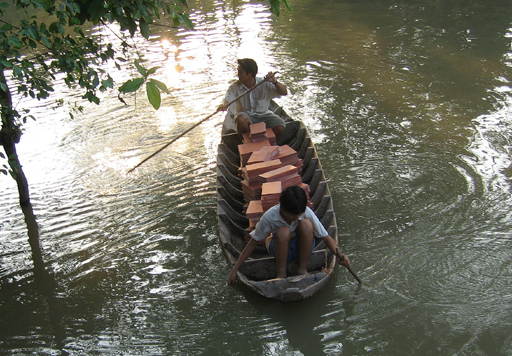 Father and son returning with a load of bricks for a home improvement project. The difference between the water level in the high water season and the low water season is typically 10 to 12 feet as can be seen by the water marks on the dike. 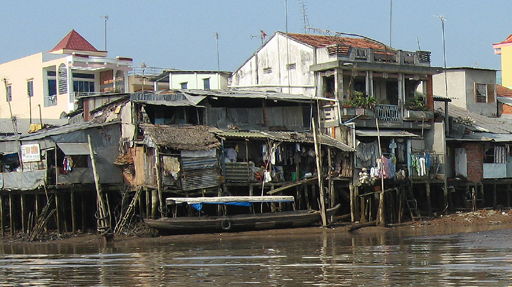 Houses are typically built on stilts to accommodate the high water season. 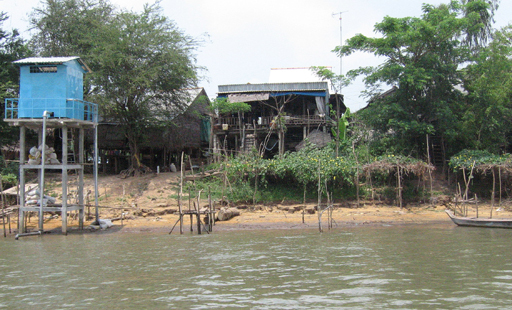 Roads in the Delta are usually built on dikes and the house raised to the road level on stilts. In some cases the road is not usable during the high water season. 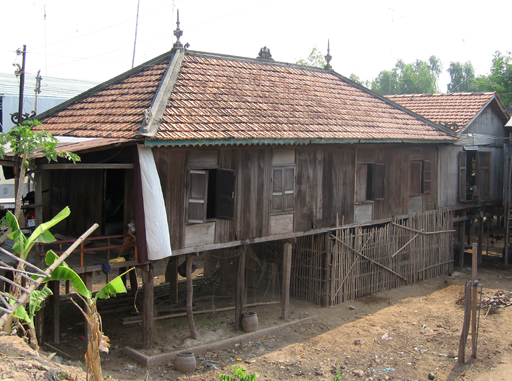 High water marks can be seen 6 to 8 feet above the road on the stilts under this house . 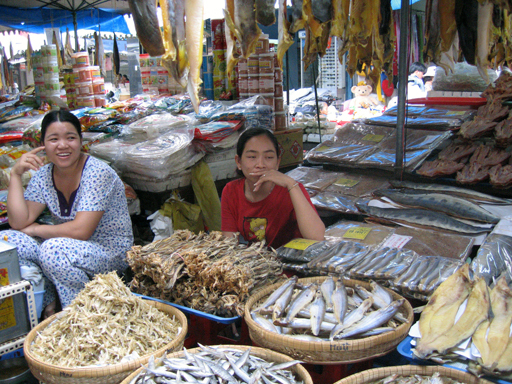 The Delta is teeming with fish, but the lack of reliable refrigeration at home makes dried fish a popular item at the market. 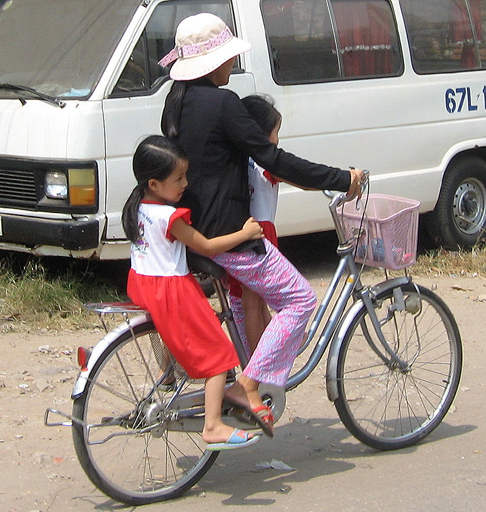 Mom and the kids biking to the market. 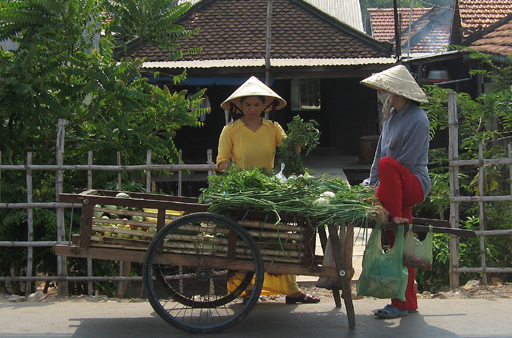 A vegetable cart bringing the market to the front door. 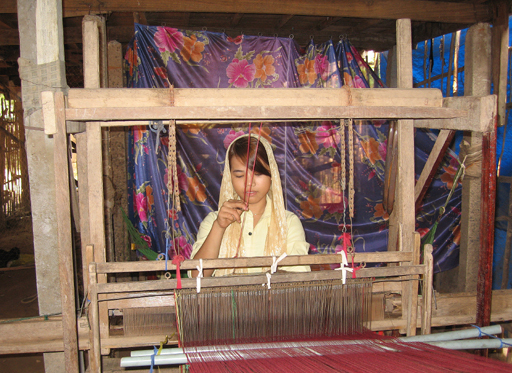 Weaving cloth on a hand loom at home is a popular way for women to supplement the family income. 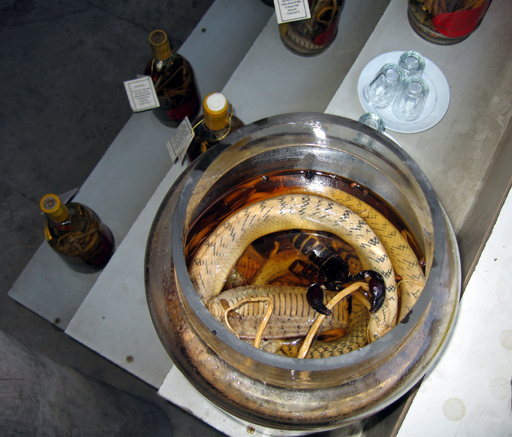 The somewhat notorious Mekong Delta Brandy is distilled from rice wine and augmented with cobras and scorpions. Jane reported that it tasted pretty good. 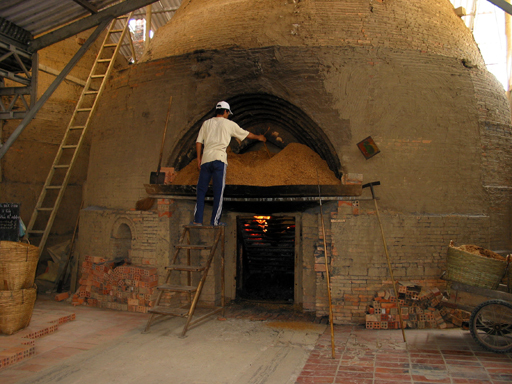 Trees are not abundant in the delta, so the brick factory uses rice husk to fuel their kilns. 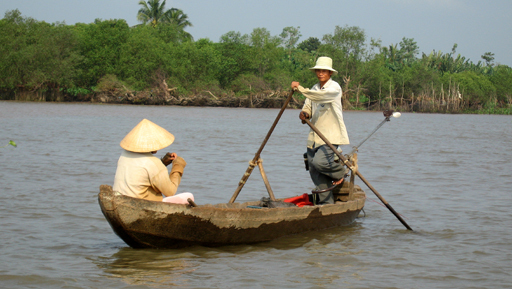 Casting a large net from a small sampan requires a good since of balance. I wonder how many times you must climb back in the sampan before the skill is mastered. 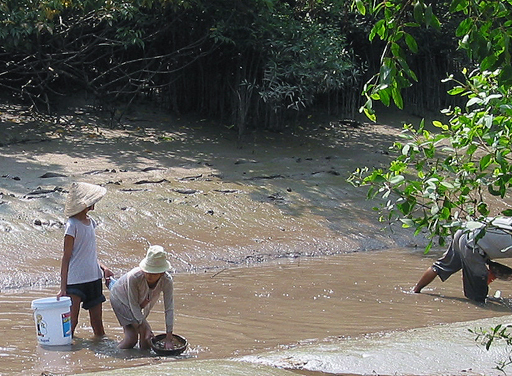 The low water season is a good time to harvest bivalves. 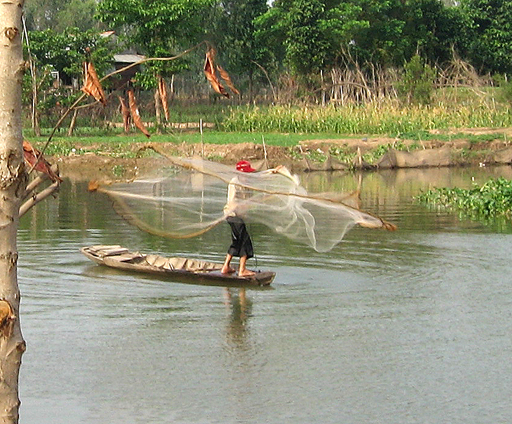 Fishing with pole and line from a sampan. 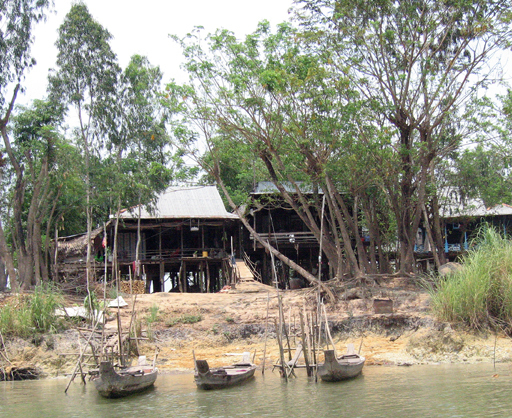 In the rural areas away from the villages houses stand on the river bank with the family sampan parked out front. An elevated water tank and pump provide this house with piped water and irrigation for the truck garden. 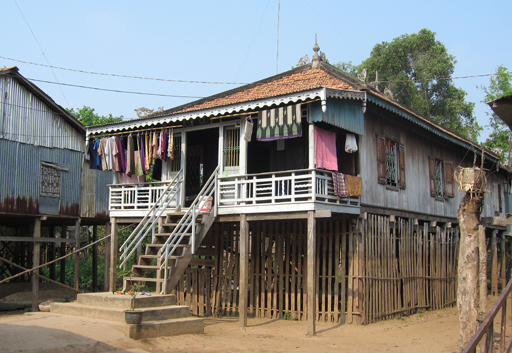 Returning home to the Mekong Pandaw after a day's touring.